The time integral of solar activity plus ocean oscillations [which are also driven by solar activity] can explain 95% of climate change over the past 400 years. The 11-year solar cycle only changes by up to 0.1% min to max, and yet according to the below GRL paper (Camp and Tung, 2007), there is even a statistically significant correlation between the ups and down of the solar cycle and temperatures, an average of almost + or - 0.2 C min to max. By projecting surface temperature data (1959 – 2004) onto the spatial structure obtained objectively from the composite mean difference between solar max and solar min years, we obtain a global warming signal of almost 0.2 C attributable to the 11-year solar cycle. Our work establishes that the surface-temperature response is correlated with the solar-cycle forcing at over 95% confidence level. For comparison, a similar relationship between response and forcing has not been statistically established for the greenhouse global-warming problem. Our result shows a global-mean warming of almost 0.2 C at the surface from solar min to solar max. Leif Svalgaard has notoriously insisted on other blogs that there was not a significant increase in TSI in the last few decades, despite his preferred SORCE/TIM team accepting the ACRIM (which revealed a +0.05% TSI increase per decade between 1980 and 2002) over the PMOD for pre-2003 TSI reconstructions. PMOD has been widely used in geophysical research. According to this composite, TSI has been almost stationary (0.009%/decade trend of the 21– 23 solar minima [Willson and Mordvinov, 2003]) and by adopting it, or the equivalent TSI proxy reconstruction by Lean et al. , some researchers and the IPCC [Intergovernmental Panel on Climate Change (IPCC), 2001; Hansen et al., 2002] deduced that the Sun has not contributed to the observed global surface warming of the past decades. Consequently, the global surface warming of DT1980 – 2002 = 0.40 ± 0.04K from 1980 to 2002 shown in Figure 2 could only be induced, directly or indirectly, by anthropogenic added green house gas (GHG) climate forcing. Contrariwise, ACRIM presents a significant upward trend (+0.047%/decade trend of the minima) during solar cycles 21– 23 (1980 –2002) [Willson and Mordvinov, 2003]. Question: Does Leif view the sunspot interval observations showing a impressive rise in solar activity (like in the graph above) as drastically different than TSI? 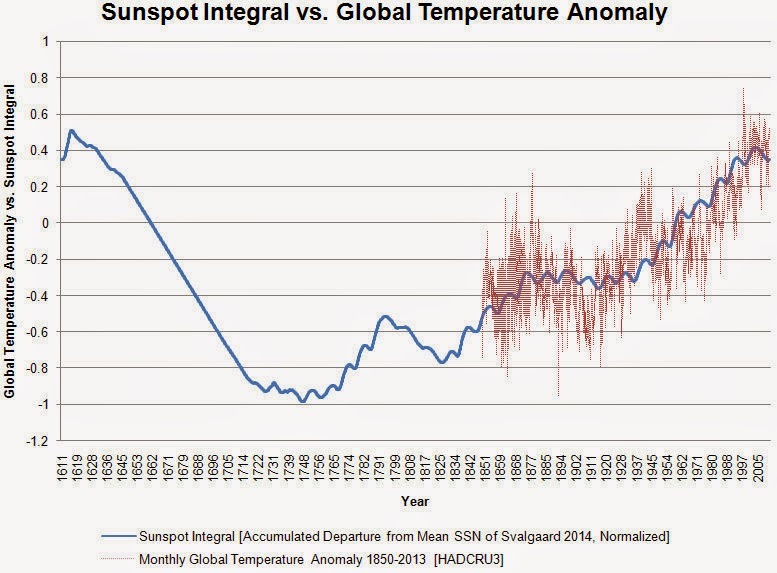 How else to explain his apparent dismissal of TSI variations versus his sunspot interval graph above? Leif's TSI estimate [which is included in the Excel file linked above] is 1361.24 Wm-2 at the beginning of 1611 & 1361.56 Wm-2 at the end of 2013, so yes no change. However, that's not really what is important - it is the accumulated change or "time integral" which most accurately demonstrates the change in solar activity over time. Leif's data beginning in 1611 show the huge drop in solar activity into the Maunder Minimum, followed by recovery of solar activity, with periodic hiatuses. TSI is by no means the whole story on solar activity due to changes of up to 100% in solar UV over just a single solar cycle, which in turn has differing effects upon ozone production, ocean penetration, solar amplification mechanisms, etc. If the oceans can accumulate energy over long periods of time (not disputed), then the Sun's energy can accumulate or drawdown over time in the same manner. Solar TSI goes 2.0 W/m2 above the normal long-term level and the planet will slowly accumulate about 0.25 to 0.5 W/m2 of that extra energy. In a few centuries, that adds up to and extra 1.0C to 2.0C in increased surface temperature. That is how the physics actually works and how it should actually be calculated. Agreed, but climate scientists really don't care about the big ball of fire in the sky.